Spider-Ham may be one of the breakout stars of Spider-Man: Into the Spider-Verse, but his character almost took a very dark turn in the animated blockbuster. As revealed by Co-director and co-writer Rodney Rothman, a joke involving the character was cut from the movie late in the process that had been doing very well in the test screenings, but given its grim nature, the gag was axed from the final cut. 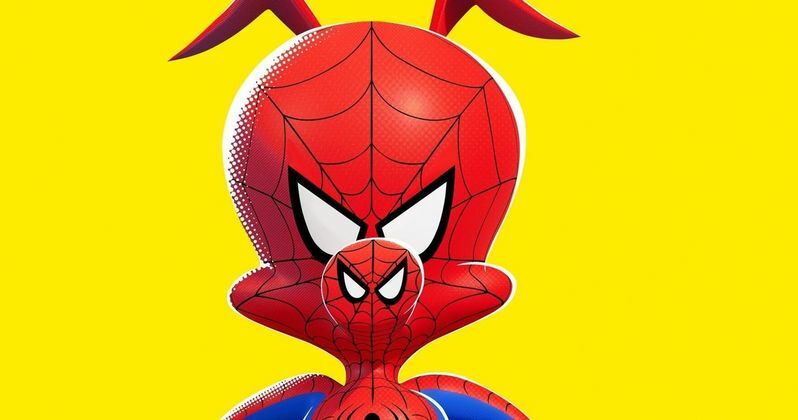 Rodney Rothman was recently interviewed on a podcast and was discussing details of the movie and, in particular, Spider-Ham, who is voiced by comedian John Mulaney. "He was simultaneously the most popular and the least popular character," Rothman said. During a crucial sequence in the movie, the various versions of Spider-Man are explaining to Miles Morales how they lost key loved ones in their life. Originally, the scene featured a very twisted joke from Spider-Ham. Here's what Rothman had to say about it. "The way that scene [originally] went is Noir said he lost his Uncle Benjamin, Peter lost Uncle Ben, and Gwen lost Peter. We went through everyone. Spider-Ham said he lost his Uncle Frankfurter. And then he said, 'He was electrocuted, and it smelled so good...' We just decided, 'This is a bad laugh. This is throwing off the energy in the scene.' Spider-Man is a real person with real feelings, and we wanted people to get that." Spider-Ham is, as the name implies, a pig. This joke, despite the fact that it "would destroy" with test audiences, loses the emotion of the scene and sort of violates the truth of the character. Peter Parker's loss of his uncle Ben defines him and every one of these versions of the character has a similar loss. Spider-Ham making light of it, and twistedly saying that his dead uncle smelled good, despite perhaps being funny, would have come at the expense of something more important. Ultimately, what audiences and critics seem to love so much about Spider-Man: Into the Spider-Verse is its honest portrayal of the character. It's a movie many have hailed as the best Spider-Man movie to date. It's deep emotion mixed with heart and humor, all balanced harmoniously. Rothman said it was a "bad laugh," which is why it was cut. Spider-Man is a real person with real feelings, and we wanted people to get that." The final cut that made it to theaters worked out quite well. Spider-Man: Into the Spider-Verse has grossed $327 million worldwide, with a sequel already in development and it was recently nominated for Best Animated Feature at the Academy Awards, following its Golden Globes win. And there's even a possibility that Spider-Ham could get his very own spin-off. Not that one joke would have ruined any of that, but this does provide a window into the thinking that helped make the movie such a success. For more with Rodney Rothman, check out his episode of The Q&A With Jeff Goldsmith Podcast.